After winning Prince William County for Barack Obama last year, local Democrats were emboldened and began searching far and wide for candidates to run for the General Assembly in 2009. And the results? Democrats recruited challenges to Delegates Jackson Miller (the usual Jeanette Rishell, a 2-time loser) and Bob Marshall (an opponent not even from the majority area of the district), and actually managed to spend money on a primary for an open seat in the 52nd District being vacated by Delegate Jeff Frederick, which should have simply been a walk-on. Meanwhile the Prince William GOP avoided such a contest for their challenger, Rich Anderson, who is running against Delegate Paul Nichols. Way to go D’s! So much for putting up a challenge in every district. Democrats seemingly forgot to play the recruiting game in the 31st District, having no nominee to challenge Delegate Scott Lingamfelter, who despite being outspent by moonbat Bill Day in 2007, went on to defeat the candidate from the Kucinich wing of the Democrat Party by almost 12 percentage points. In fairness to the Ds, they might have actually come to realize this one was a lost cause. That said, on June 6 the Prince William Democratic Committee put out a call notifying potential voters of a 31st Legislative District Democratic Firehouse Primary at 3:00pm on June 9th at their party headquarters on Dale Boulevard. It sounds simple enough, until you realize that by issuing this call, the Prince William Democratic Committee violated their party bylaws and at the same time issued a badly botched call. First, the call notes in its second paragraph that “Any person wishing to be a candidate for nomination for either office” should file a written declaration with Chairman Frisbie. Unless they know something the rest of the world doesn’t, each party is only entitled to one candidate per House race, except perhaps in Chicago. Second, the call states that it is “Authorized by the 51st Legislative District Committee.” I’m not quite sure how that is supposed to work since the call claims it is for the 31st Legislative District. Why isn’t that Legislative District Committee authorizing the thing? Perhaps this may have been a hasty typo to correct, well, the absence of a call in the first place. The Committee That Can’t Shoot Straight ought to go re-read its own Party Plan, approved under State Chairman Cranwell in 2008. Section 7.2 of Article 7 goes on to say that “The nominating committee shall advise State headquarters in writing of the method of nomination for any office within 7 days of the decision.” There was no evidence that the Prince William Democrats ever notified the State headquarters of this, making it questionable whether this ever occurred. Article 9, Section 9.1 clearly says that when candidates for office “are to be selected by any method other than primary, notice of the time, place, and method of selection shall be given by publication in a newspaper of general circulation in the county or city at least 7 days, but not more than 2 weeks, prior to the date of such selection.” It goes on to say that if a caucus/convention is used, a second notice is not needed and that either notices may be placed on the internet. Wait. Did that say seven days notice? Perhaps Chairman Frisbie has yet to discover the calendar since their call allowed for three days notice, not seven as required in Article 9, Section 9.1 of their own party plan! At least when Brian Moran gave up his seat and ran a convention in a rush, Fairfax Dems managed to adhere to the rules. This kind of behavior starts to make Iran’s elections look pretty good. I have heard that when Frisbee was questioned by GOP chairman Lyle Beefelt as to how they could ignore the seven day requirement, he e-mailed back that the PWCDC had received a waiver from the state party. The only problem is that, again according to the Democrat Party Plan, you can only have a waiver for a special election. He also said they posted that waiver on the local Prince William County Democratic Committee website. False. The only thing up on the 31st District was the mangled and illegal firehouse primary call. Leave it to Republicans to help educate the Dem unit chairs on what their own rules are. In summary, the Prince William Dems managed to issue an illegal Firehouse Primary notice, have it issued by the wrong Legislative District Committee, leave an incumbent unchallenged, and announce that they have two open spots on the ballot designed for one. Pretty ridiculous. 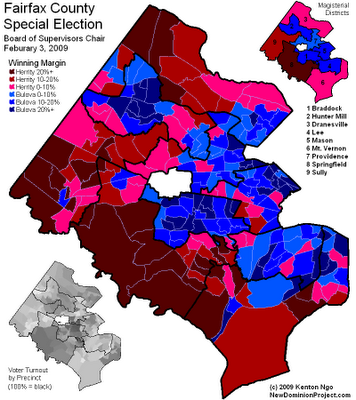 Republicans in Fairfax County, the so-called home-base bastion of Democrats, are challenging every Democrat incumbent in 2009. In Prince William County, the effort falls flat, again, and pretty hilariously at that. Of course all this confusion and bumbling leaves Delegate Scott Lingamfelter free to campaign for other Prince William County delegates since the PWCDC can’t seem to come up (legally) with an opponent in the 31st District. I Lingamfelter this weekend in the Stonewall precinct, campaigning for Bob McDonnell and Delegate Jackson Miller. I guess in the end I owe the PWCDC some thanks. John is 63 years old and owns his own business. He is a life-long Republican and sees his dream of retiring next year is now all but gone. With the stock market crashing and all the new taxes coming his way, John knows he will be work ing for a good number more years. I am replying to your request for more money. Ashley, you know I love you dearly and am sympathetic to your financial plight. Unfortunately, times have changed. With the election of President Obama, your Grandmother and I have had to set forth a bold new economic plan of our own…..the ‘Ashley Economic Plan’. return have forgone many things like fancy vacations, luxury cars, etc. We have work ed hard and were looking forward to retiring soon. But this plan has changed. Your president is significantly raising our personal and business taxes. He says it is so he can give our hard earned money to other people. Do you know what this means, Ashley? It means less income for us. Less income means we must cut back on many business and personal expenditures. One example is, we were forced to let go of our receptionist today. You know her. She always gave you candy when you visited my office. Did you know she worked for us for the past 18 years? I can’t afford her anymore. That is a taste of the business side. Some personal economic affects of Obama’s new taxation policies include none other than you. You know very well that over the years your grandmother and I have given you thousands of dollars in cash, tuition assistance, food, housing, clothing, gifts, etc., etc. By your vote, you have chosen another family over ours for help. 202-456-1111. That is the direct telephone number for the White House. You yourself repeatedly told me I was foolish to vote Republican. You said Mr. Obama is going to be the people’s president and is going to help every American live a better life. Based upon everything you have told me and things we heard from him as he campaigned, I am sure Mr. Obama will be happy to send a check or transfer money into your checking account. Have him call me for the transaction and account numbers, which by now I know by heart. those who vote for the president should consider what the impact of an election will be on the nation as a whole, and not just be concerned with what they can get for themselves (welfare, etc.). What Obama voters don’t seem to realize is all of the “government’s” money he is’redistributing’ to illegal aliens and non-taxpaying Americans (deemed “less fortunate”) comes from tax money collected from income tax-paying families. Remember how you told me, “Only the richest of the rich will be affected”? Guess what, honey? Because of our business, your Grandmother and I are now considered to be the richest of the rich. On paper, it might look that way. But in the real world, we are far from it. But, as you said while campaigning for Obama, some people will have to carry more of the burden so all of America can prosper. You understand what that means, right? It means that raising taxes on productive people results in them having less money. Less money for everything, including granddaughters. you’ve received from us over the years, and compare it to what you expect to get over the next four years from Mr. Obama. number referenced above when you need help. The Fairfax GOP is actually not challenging David Bulova (and maybe Adam Ebbin). Pastor Torian the Democrat might do it in the 52nd, regardless of his seperation of church and state issue (which only seems to apply to conservative Catholics like Bob Marshall not that anyone left of center notices) as the Republican in the 52nd is largely unknown (who is he again?) . . . Jackson Miller should make chop suey out of Ms. Rishell again as she is just too far left and not electable . . . and overall this I sense a come back for R’s in general now that the Obama hype is wearing thin and we see folks are still unemployed, homes are still going to foreclosure, and interest rates are rising and all we have to show for it is 60% of GM now belongs to us, the deficit has exploded and the “poor” are getting free stuff in even greater amounts thanks to you and me who actually work and pay our bills . . . It was really only a matter of time. When libs don’t get their way, they just do what they want. Ashley is a spoiled brat> Her grandfather enabled her life style, which was clearly beyond her means. Drives a late model car, wears all the latest fashions, likes to go out and eat out. She e-mailed you and asked for money as she had done many times before blah, blah, blah. Why didn’t you tell the kid to get a job, grow up, and live within her means? Blame THAT on Obama if you can! I blame a softie Grandfather. she should suffer the consequences of her bad behavior! Good for Grandpa.